As the field turned for home in last weekend’s Blue Grass Stakes, things were looking good for the 2011 Breeders’ Cup Juvenile champion Hansen. After breaking sharply, the son of Tapit appeared to be on cruise control as he recorded a moderate, yet respectable, -6 early speed ration (ESR) while building a comfortable advantage entering the homestretch. With a furlong to go, Hansen led by 2 ½ lengths and appeared well on his way to his fifth victory in six career starts. But Dullahan had other plans. Moving like a shot on the outside, the 3-1 second betting choice rushed past trainer Michael Maker’s colt like he was one of the many statues gracing the Keeneland grounds and won by 1 ¼ lengths. 1 ¼ lengths… that’s about a fifth of a second, the same amount of time researchers claim it takes for people to fall in love. Yet, in that fifth of a second I fell out of love with Hansen. Look, it’s not like I was writing the colt poems or serenading it with old Luther Vandross tunes in the first place, but I must admit, after the Gotham, I was impressed. The Juvenile champ had rallied from off the pace for the first time ever and earned a career-best 105 Brisnet speed figure that day — how could I not be a little smitten? But facts are facts and history is history — and neither bode well for Hansen. Since 1992, there have been 19 horses that lost their final Derby prep after leading at the first call of that race. Of those, only one — that’s right, uno — managed to even hit the board. That was Lion Heart in 2004; all the others finished fourth or worse. Frankly, it’s not hard to understand why such animals have been so unsuccessful in Louisville. The Derby is no place for one-dimensional steeds, much less those that appear hell-bent on getting the early lead. In a previous blog posting, I made it abundantly clear that Hansen would need to forego his freewheeling ways if he was to triumph at Churchill Downs on the first Saturday in May. Sadly, in the Blue Grass, it was not utilized in a sensible fashion… and I fear it won’t be in the Kentucky Derby either. No sooner had Bodemeister, a horse named after trainer Bob Baffert’s son Bode, crossed the wire in the Arkansas Derby than the buzz began: Was this a super horse, the animal to break the curse of Apollo and win the Kentucky Derby despite not racing at the age of two? Crist notes that “Bodemeister earned a Beyer Speed Figure of 108 winning at Oaklawn Saturday, which is 10 to 14 points higher than the winning figures in this year's four other Grade 1 prep races for the classics: the Blue Grass (98), Wood Memorial (98), Florida Derby (95) and Santa Anita Derby (94). Later in the piece, Crist compares Bodemeister to another impressive winner of the Arkansas Derby. OK, I get that, but the fact is Bodemeister has never faced any kind of adversity. Crist compares the colt to Curlin; I compare him to Bellamy Road. Few could argue that the 2005 Kentucky Derby favorite was any less impressive in his final prep, the Wood Memorial, than “Bode” was in his. Bellamy Road earned a 120 Beyer and a 115 Brisnet speed figure for his performance that spring at Aqueduct — numbers that haven’t been approached before or since. Yet, when trainer Nick Zito's stable star was unable to wrest the lead from a host of early challengers while racing 4-5 wide in the Run for the Roses, he faded. I can easily imagine a similar fate for Bodemeister, especially since I don’t think Hansen will allow him to catch any breathers in the early going. Trivia Question (answer below): What does Bodemeister have in common with former Kentucky Derby champs Reigh Count (1928), Secretariat (1973), Pleasant Colony (1981) and Sea Hero (1983)? Trivia Answer: All five were bred in the state of Virginia. It's going to be ESPECIALLY interesting now that Trinniberg has been added to the early pace fray. BODE WILL SIT OFF PACE AND BLOW BY THEM. WHO CARES ABOUT THE MILER TRINNEBERG. BODE WILL WIN TRIPLE CROWN. CLASS PEDIGREE. RIDE MIKEY LIKE THE WIND. KEPPS IMPROVING HIS BEYER RATINGS. BOBBY B WILL TIGHTEN THE SCREWS ON HIM OVER THE NEXT WEEK AND A HALF. GOT BIG FUTURE BET ON HIM FROM LATE MARCH. SHOW ME THE MONEY BODE. NOW EVERYONE IS ON MY BANDWAGON. Kudos on the future bet. I have no issue with a bet that will pay multiples more than the horse will on Derby Day. On Derby Day, Bodemeister will have no value (if the morning line makers are correct, which I think they are). There is a fundamental flaw in your Bellamy Road comparison. Look at the early, mid, and late Brisnet pace figures. Bellamy clearly uses himself up on the front end. The public made a bad mistake making him the favorite. In a race where these young horses are going to be asked to go 10 furlongs for the first time, its crucial to pick a horse that gets stronger as the race progresses. Bode clearly fits that bill. In both the Ark. 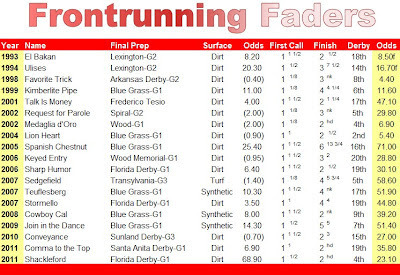 and the San Fil Bode pairs triple digit late pace figures and triple digit speed figures. Additionally, he could have produced even more impressive numbers in the Ark. had he been challenged in the stretch. Smith stood up on him 1/16th out. I'm not sure one can compare such things today. Sadly, once all-weather surfaces came on the scene in a big way (starting in 2007-2008), the game fundamentally changed. Tactics went out the window and early speed was no longer thought to offer the advantage it once did. This was/is patently untrue on dirt, yet ESRs have been declining for years (http://blog.twinspires.com/2011/03/no-early-speed-no-triple-crown.html). 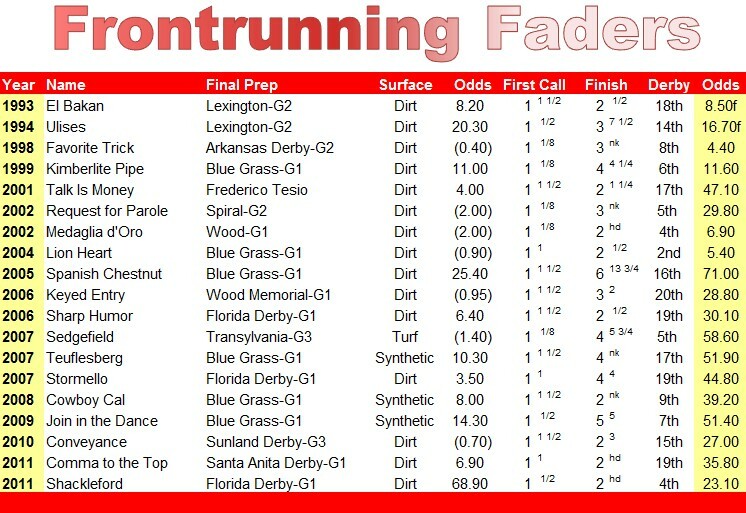 Of the 32 major Kentucky Derby preps listed on kentuckyderby.com, only four featured “brisk” paces (-10 ESR or lower). My point here is that Bodemeister hasn’t expended more early energy because he hasn’t HAD too. So the question is: Will he put in the kind of performance in Louisville that he did in Arkansas if he has to use more energy early to either set or stalk the pace? When Bellamy Road, who’d recorded a -7 ESR in the Wood, was asked to stay in touch with a -15 ESR in the Derby, he wasn’t up to the challenge. However, that -15 ESR was the second-fastest in history (behind the -16 recorded in 1986). Perhaps Bodemeister will face a softer pace scenario — heck, if it’s anything like last year, we can probably drape him in roses now — but if he DOES have to quicken, I can absolutely see him going the way of Bellamy Road. My point in comparing the two horses — Bodemeister and Bellamy Road — is to point out that horses run their best when they are comfortable and get what they want. So far, in his short career, Bodemeister has been very comfortable.